1) H.R.H. 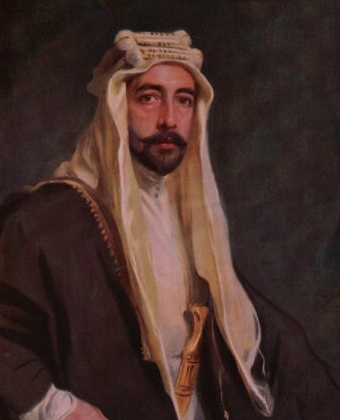 Crown Prince (Wali al-Ahd) Ghazi, who succeeded as H.M. Ghazi I, King of Iraq - see below. 1) H.R.H. Princess (Amira) Azza. b. at Constantinople, Turkey, 1906. Received into the Greek Orthodox faith, 1936. Deprived of her title of Princess and style of Royal Highness on her marriage, but had these restored to her in 1947. m. at Athens, Greece, 27th May 1936 in a marriage not recognized by Iraqi law (sep. 1939 and div. at Rome, Italy, 1943) Anastassios Haralambides (b. at Rhodes, 1912), sometime hotel waiter. She d. at Amman, Jordan, March 1968 (bur. there at the Royal Mausoleum, Raghadan Palace). a) Husaima [H.H. Sharifa Huzeima Nasser], CVO (19.7.1966). Lady in Waiting to Princess Muna al-Hussein of Jordan. 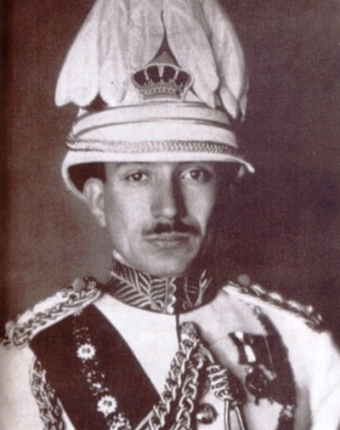 m. Sharif Ghazi bin Rakan Nasser (b. at Cairo, Egypt, 1939), son of Sharif Rakan bin Nasser. She had issue, one son and three daughters - see Hijaz. b) Nafisa. m. (div.) Dr David Frederick Horrobin (b. at Bolton, Lancs, 6th October 1939; m. second, Sherri Clarkson, and d. 1st April 2003, bur. Isle of Harris), educ. Queen Elizabeth's Grammar Sch, Blackburn, King's Coll, Wimbledon, Balliol Coll, Oxford (MA, BM BCh 1968, DPhil 1968), and St Mary’s Hospital, London, Fellow at Magdalene Coll, Oxford 1963, Registrar Hexham General Hospital, Professor and Chair. Medical Physiology at Nairobi Univ 1969-1972, Reader in Medical Physiology at Newcastle Univ 1972-1975, Professor of Medicine Montreal Univ 1975-1979, Dir Efamol Ltd. 1979-1981, Efamol Research Inst. in Nova Scotia 1981-1987, CEO Scotia Holdings PLC 1987-1997, and Laxdale Ltd 1997-2003, author of "Science is God" (1969), "Principles of Biological Control" (1970), "A Guide to Kenya and Northern Tanzania" (1971), "The International Handbook of Medical Science" (1972), "Practical Physiology" (1979), "The Madness of Adam and Eve" (2002), editor of "Medical Hypothesis" etc, son of Frederick Horrobin, by his wife, Betty. She had issue, one son and one daughter. 3) H.R.H. Princess (Amira) Rafi'a. b. at Mecca, 1910. She d. unm. at the Qasr Abyiadh, Baghdad, 11th February 1934 (bur. there at the Royal Mausoleum, Adhamiya). 1) H.R.H. 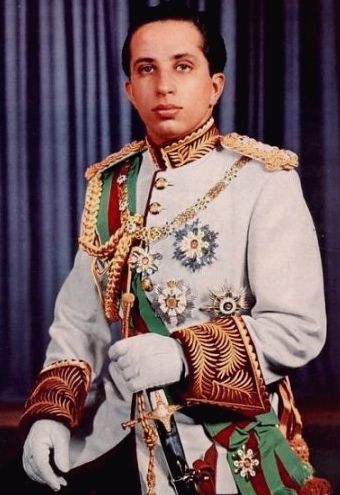 Crown Prince (Wali al-Ahd) Faisal, who succeeded as H.M. Faisal II, King of Iraq - see below. 1939 - 1958 H.M. Faisal II, King of Iraq, GCVO (24.9.1952), Royal Victorian Chain (16.7.1956). b. at the Qasr al-Zuhoor, Um Al-Azzam, Baghdad, 2nd May 1935, only son of H.M. Ghazi I, King of Iraq, by his wife, H.M. Queen Aliya, second daughter of H.M. 'Ali bin Hussein, King of the Hijaz and Grand Sharif of Mecca, GBE, educ. privately in Baghdad, and at Harrow Sch, Mdsx. Appointed as Heir Apparent and Crown Prince, and invested with the title of Wali al-Ahd, at birth. Proclaimed as King on the sudden death of his father, 4th April 1939. Reigned under the Regency of his maternal uncle, Field Marshal H.R.H. Crown Prince Abd al-Ilah, GCB, GCMG, GCVO. Came of age and assumed full ruling powers by taking the oath to the Constitution before the Iraqi Parliament, at Baghdad, 2nd May 1953. Proclaimed as Head of State and Commander-in-Chief of the Arab Federation (of the Hashimite Kingdoms of Iraq and Jordan), 14th February 1958. Field Marshal Royal Iraq Army, Admiral of the Fleet Royal Iraqi Navy, and Marshal of the Royal Iraqi Air Force 2/5/1953. Colonel-in-Chief The Royal Bodyguard and the Hashimi Regiment 4/4/1939-1958. Hon Air Vice-Marshal, RAF 2/5/1955. 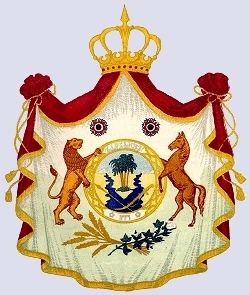 Grand Master of the Grand Order of the Hashimites (Wissam al-Kabir al-Hashimi), the Order of Faisal I (Wissam al-Faisal al-Awwal) and the Honourable Order of the Two Rivers (Wissam al-Imtiaz al-Rafidain), 4/4/1939. Author of “How to Defend Yourself” (1951), an Arabic book on judo and self defence. Rcvd: the Collar of the Orders of Hussein ibn 'Ali of Jordan (1953), and the Muhammadiya of Morocco (26.5.1956), the Grand Collar of the Order of Pahlavi of Iran (18.10.1957), GC of the Orders of the Renaissance (special class) and Independence of Jordan, Netherlands Lion (25.4.1953), Yoke and Arrows of Spain with collar (18.5.1956), and Leopold of Belgium (mil 16.7.1956), the Order of King Abdulaziz 1st class of Saudi Arabia (2.12.1957), Chief Cdr Legion of Merit of USA (16.8.1952), etc. He was k. (s.p. *) by the military plotters outside the Qasr al-Rihab, Harithiya, Baghdad, 14th July 1958 (bur. there in secret at the Royal Mausoleum, Adhamiya). * Note: At the time of his murder, King Faisal II was engaged to H.H. Princess Sabiha Fazila Khanum Sultana, only daughter of H.H. Prince Damad Muhammad 'Ali Ibrahim Bey Effendi of Egypt, by his wife, H.I.H. Princess Zahra Khanzadi Sultana, second daughter of Captain H.I.H. Prince Omar Faruk Effendi of Turkey.